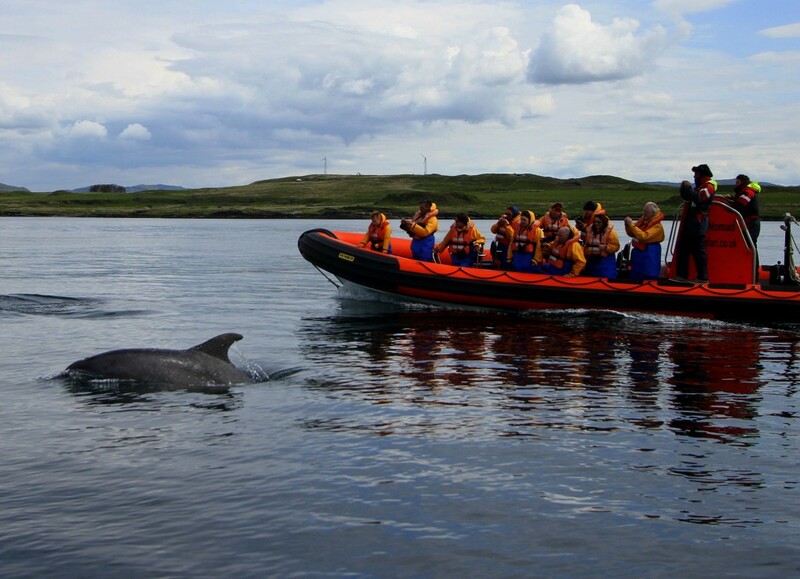 A fantastic general marine wildlife and nature experience, the Corryvreckan Wildlife Tour culminates in a visit to the infamous Gulf of Corryvreckan, home to the World's Third Largest Whirlpool. With 3 powerful open RIBs, Seafari Adventures offers the best in 'Corryvreckan Cruises'. Our boats depart frequently throughout the day. Please note, tidal action in the Corryvreckan changes with the tides so please ask us when booking what the conditions are likely to be like. For more information please read our page on the Corryvreckan Whirlpools. PRICES - ADULTS £45 and CHILDREN £35 - Family discount prices are available, please contact us for more information. Please note, we require minimum passenger numbers to confirm our trips - we will inform you when your trip has reached the required passenger numbers. Our expert guides will identify and offer detailed information on all the wildlife seen during your tour. 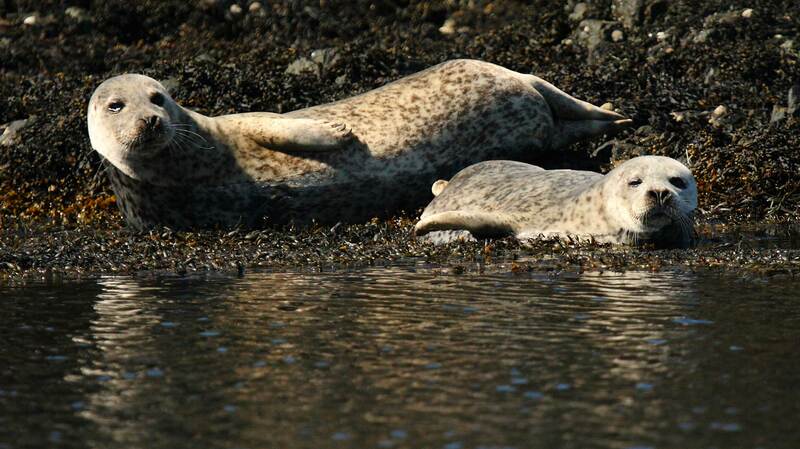 To the delight of many, our wildlife sightings can include whales, dolphins, seals, porpoise, basking sharks, common seals, Atlantic grey seals and otter. The magnificent white tailed sea eagle has a nest on this tour route and, along with golden eagle, are spotted regularly. There is a myriad of seabirds in the air from the largest gannet to the smallest guillemot and razorbill. Divers, ducks and geese are migratory but we have resident populations of herons, oystercatchers, shags and cormorants. On the land it is easy to spot Red deer, fallow deer and the feral goats which inhabit the islands. Our commentary includes natural history and folklore. Whilst the Corryvreckan Willdife Tour passes through one of the whale feeding grounds we do not spend a great deal of time 'waiting' for the whales. Should you wish to take a whale watching tour from Easdale we offer dedicated whale watching and wildlife tours as soon as we are regularly sighting these magnificent creatures in our area. This natural phenomenom is tide dependent. The whirlpool flows four times in any 24 hour period every day regardless of the weather. As the tide changes direction there are times when the whirlpool is quiet. Tide height, governed by the position of the sun and moon relative to the earth affects the amount of water flowing through the Gulf. If the currents are very strong, the marine wildlife tends to move away from The Gulf. If there is a gentle tide the cetaceans tend to be more active feeding. Our ticket office will always offer advice and guidance on the likelihood of seeing any whirlpool activity whilst out on a Corryvreckan Wildlife Tour - however, it should be noted that the focus of these tours is the wildlife. We use our 10m Open RIBs** for this tour. Designed and purpose built and fitted out at our own workshop facility these boats far exceed current safety legislation. We offer individual seats for all our passengers, We have seats specially adapted for parent/child safety. We are able to accommodate passengers with disabilities or requiring to be seated in their wheelchairs. ** Please note, there may be occasions, during periods of poor weather when the skipper may decide that, for passenger comfort, the cabin RIB Celtic Voyager will be used. This is a skipper's decision and we reserve the right to change boats. Our open RIBs are perfect for wildlife watching - Corryvreckan Wildlife Tour. As we have a fleet of boats we can easily accommodate large groups. There is plenty of parking available in Ellenabeich for coaches or campervans ! We can arrange for your group to take all of our boats at the same time so great fun can be had by all. We are happy to accommodate large group bookings for our Corryvreckan Wildlife Tour. Our boats have a track record second to none. Our skippers are highly experienced and our crew are suitably qualified. Powered by twin 300HP Yamaha outboard motors our RIBs cruise comfortably and effortlessly at 25 knots but are capable of far higher speeds. Our Corryvreckan Wildlife Tour operates daily during the season from the end of March until the end October (subject to weather conditions). For up to date weather information or for winter sailing times please phone 01852 300003 or e-mail for availability.